You want it all: healthy, hydrated hair that isn’t weighed down by heavy products. Dry hair needs special care, but to maintain its bounce and body, you need a lightweight product that still delivers a powerful hydrating boost. TRESemmé® Botanique Nourish & Replenish Leave-In Hydrating Mist is a moisturizing leave in hair conditioner that leaves hair light and free, thanks to its lightweight hair spray formula. The mist hydrates deep into hair so you’re left with soft, healthy tresses. With coconut milk and aloe vera, this hair spray smooths and detangles dry, damaged hair, leaving you with revitalized, resilient locks. This hairspray for women in need of a hydration boost is formulated with a craft blend of botanicals, and is free of parabens, silicones and dyes. How to achieve hydrated hair that isn’t weighed down by products using Tresemme hair spray: Prep hair by washing and conditioning with TRESemmé® Botanique Nourish & Replenish Shampoo and Conditioner. Mist liberally over damp hair from roots to ends. Run your fingertips or a wide tooth comb through hair to detangle. No rinsing necessary. Style your freshly hydrated hair with your favourite TRESemmé® professional hair products. 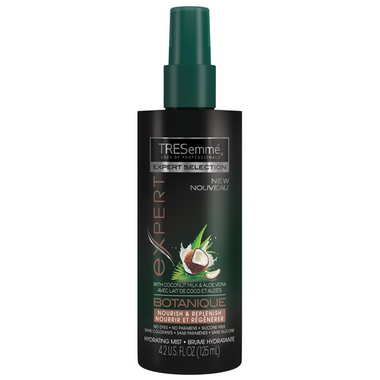 Did this TRESemmé® hair spray deliver lightweight hydration to dry hair? Let others in on the magic; leave a review. Really bad scent, and leaves hair dried out. Worst product. Smells like rotting coconut vodka and leaves hair very dry.